Now we can see that a = −4, b = x2, and c = −2x. Comments: We get real solutions when x is such that x4 − 32x ≥ 0. 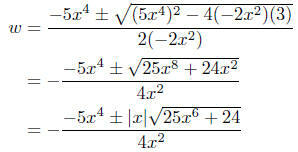 This problem will be continued in the section on Solving Inequalities. Now it is apparent that a = −2x2, b = 5x4, and c = 3.
has the effect of changing ‘±’ (plus or minus) to ‘ ’ (minus or plus). we can and do cancel it. 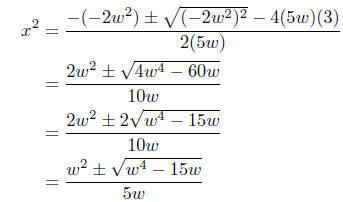 Solution to (b): Solve for x2 in 5wx4 − 2w2x2 +3 = 0.
made after we analyze some inequalities . . . later. (a) Solve for x: 4x + 12 ≤ 5. (a) Solve for x: 2x − 1 ≤ 5x + 2. (b) Solve for x: 3x + 4 > 1 − 6x. (a) Solve for x: 3 < 2x + 1 ≤ 12. (b) Solve for x: −2 ≤ 2 − 5x ≤ −1. Now, do a Sign Chart Analysis. would satisfy the inequality—that’s a good reason! x(x − 1)(x − 3) > 0.
the expression is zero, which does not satisfythe inequality. x2 − 3x − 4 ≤ 0. (x + 1)(x − 4) ≤ 0. Now do a Sign Chart for (x + 1)(x − 4). Now do a Sign Chart for (x − 1)(x − 5). Begin byfactoring: Now do a Sign Chart. It is this inequality we solve using the Sign Chart Method. 7.18. Solution: Solve x4 − 32x ≥ 0. First factor: x(x3 − 32) ≥ 0.
cubes), but in this instance it would be a waste of pencil lead to do so. Presentation of Solution: Solve for x: x4 − 32x ≥ 0. Otherwise, there are no real solutions for y.